For other uses, see Hauschka (disambiguation). Volker Bertelmann (born 1966) is a German pianist and composer who mainly performs and records under the name Hauschka. He is best known for his compositions for prepared piano. Volker Bertelmann was born in Kreuztal. He grew up in the village of Ferndorf in the district of Siegen-Wittgenstein, North Rhine-Westphalia. The fifth of six children, he discovered piano playing at the age of nine at church service. He began studying classical piano and continued taking lessons for the next ten years. Bertelmann formed his first rock band when he was fourteen. During the following years he was commissioned to compose music for television and sang in a number of other bands. After leaving school he moved to Cologne, where he began studying medicine and then switched to a course in business economics, but gave up both in order to concentrate on music. In 1992, Hauchka and his cousin formed the hip-hop duo God’s Favorite Dog, who became known above all for their tracks Love and Pain and Sway. They released an album on Sony Music's Epic label and went on to perform nationally and internationally, among others as a support act for Die Fantastischen Vier. The duo split in 1995 to pursue other directions. After a period of drifting, Bertelmann moved to Düsseldorf and started making music again, drawing on his years of classical piano training. He composed pieces for piano and released them under the alias Hauschka – as he wanted to find a east european sounding synonym and he found Bohemian composer Vincenz Hauschka as a reference. The first Hauschka album Substantial was released in 2004 on the Cologne label Karaoke Kalk, followed in 2005 by The Prepared Piano on the same label. On this second album Bertelmann explored the possibilities of the prepared piano by wedging pieces of leather, felt or rubber between the piano strings, wrapping aluminium foil around the hammers, placing small objects on the strings or joining them together with guitar strings or adhesive tape. In 2007 Bertelmann signed a recording contract with 130701, an imprint of FatCat Records, through which his album Ferndorf was released in 2008. Following a concert performance with the Magik*Magik Orchestra, Bertelmann decided to integrate other musical instruments into his compositions, and in January 2010 the resulting works were performed in San Francisco by an orchestra led by Minna Choi. With Ian Pellicci as the sound engineer, they were recorded in John Vanderslice’s Tiny Telephone studio. Volker Bertelmann then recorded the piano tracks at Studio Zwei in Düsseldorf, and the album Foreign Landscapes was released on the 130701 label later that year. On his 2011 album Salon des Amateurs Bertelmann collaborated with notable musicians such as Samuli Kosminen (Múm, Edea), Jeffrey Zeigler (ex Kronos Quartet), Pekka Kusisto, The band Múm, Nik Bartsch, Henrik Schwarz and Hilary Hahn, as well as Calexico’s Joey Burns and John Convertino. These recordings were originally intended as a joint release with Foreign Landscapes, whereby on the one hand the piano was going to be just one instrument among many, and on the other it was to be used primarily as a rhythm instrument. The recorded pieces did not fit together in the way Bertelmann had envisaged, however, so he decided to release the two albums separately. Foreign Landscapes represents a shift of focus away from the prepared piano as a solo instrument, while Salon des Amateurs signals a move towards a more strongly rhythmic approach. The release of Salon des Amateurs was followed by the release of remix album Salon des Amateurs Remixes, which featured notable contributions by Michael Mayer, Matthew Herbert, Max Loderbauer & Ricardo Villalobos, Alva Noto and Steve Bicknell. In May 2012 Silfra, a collaborative album with the American violinist Hilary Hahn, was released on Deutsche Grammophon. Named after the Silfra rift in Iceland, it consists of twelve improvisations by Bertelmann and Hahn that were recorded by Valgeir Sigurdsson at Greenhouse Studios in Reykjavík. In 2012 Bertelmann wrote his first score for a feature film, entitled Glück, which was directed by Doris Dörrie. In 2015, Bertelmann was an artist-in-residence at the MDR Leipzig Radio Symphony Orchestra. He created three pieces for them, most notably his collaboration with Múm entitled ‘Drowning’, which they premiered at the Gewandhaus in Leipzig on June 27, 2015. In 2016, he was commissioned to create a piece for acclaimed cellist Nicholas Altstädt. The piece, Lost, premiered at Viva Cello in September 2016. In 2016, Bertelmann collaborated with Dustin O'Halloran on the score for the Oscar-nominated film Lion. The score of the film was nominated for all major awards including the Academy Awards, Golden Globes, BAFTAs and Critics’ Choice Awards. In 2017, he released solo album ‘What If’ on City Slang and Temporary Residence. The album explores the possibilities of his music, inspired by hip-hop, performed by fast and accurate player pianos. Bertelmann wrote two pieces for Avi Avital, called Flood and Drought, which premiered at the Schleswig-Holstein Musik Festival in July 2017. In 2018, he composed the score for the film Adrift, which is based on the true story of a sailor stranded at sea after a storm. Adrift is directed by Baltasar Kormákur and stars Shailene Woodley and Sam Claflin. Hauschka stated, "Collaborating with Baltasar Kormákur was a wonderful experience and he gave me a lot of freedom to find the right sound for the film. Adrift tells a story about love and the fragility of human existence, so I wanted to create some sort of instrumental tension to reflect both the darkness and peril, as well as the lightness and love in this film. We ended up recording a full string orchestra at British Grove in London and added piano and experimental electronics to create a diverse and dynamic score. I'm very happy with the result, and I feel fortunate to have been part of this powerful film." ^ "Oscar-nominated composer Hauschka rips open the piano on "Constant Growth Fails"". 2017-02-09. Retrieved 2017-07-14. ^ Ehrlich, David. "How Hauschka And Dustin O'Halloran Helped Lion Find Its Way Home | IndieWire". www.indiewire.com. Retrieved 2017-07-14. ^ "How Hauschka fuses prepared piano, modern software and analogue synthesis". MusicRadar. Retrieved 2017-07-14. ^ "It's piano but not as we know it from Hauschka". www.theaustralian.com.au. Retrieved 2017-07-14. ^ "Hauschka | Pitchfork". pitchfork.com. Retrieved 2017-07-14. ^ Teinert, Dieter. "Hauschka - What If - SLANG50117". deejay.de (in German). Retrieved 2017-07-14. ^ Ross, Daniel. "BBC - Music - Review of Hauschka - Foreign Landscapes". Retrieved 2017-07-14. ^ "Hauschka: Foreign Landscapes Album Review". pitchfork.com. Retrieved 2017-07-14. 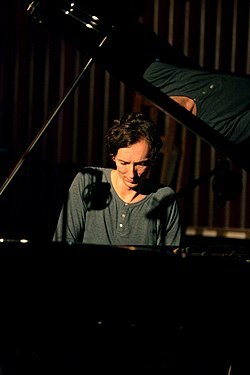 ^ "Slamming Colour on the Canvas: A Conversation with German Piano Maestro Hauschka". Thump. Retrieved 2017-07-14. ^ "theartsdesk on Vinyl 27: Spoon, Hauschka, Emerson, Lake & Palmer and more". www.theartsdesk.com. Retrieved 2017-07-14. ^ Smith, Steve (2012-07-06). "'Silfra,' by Hilary Hahn and Hauschka". The New York Times. ISSN 0362-4331. Retrieved 2017-07-14. ^ "The Quietus | Features | Escape Velocity | Sounds From A Ghost Town: An Interview With Hauschka". The Quietus. Retrieved 2017-07-14. ^ Beck, Jennifer (2015-06-30). "Drowning – Live-Premiere: Hauschka & Múm spielen atemberaubendes Konzert mit Sinfonieorchester". Spex Magazin. Retrieved 2017-07-14. ^ "Film scores range from experimental sounds ('Arrival') to simple, hushed restraint ('A Monster Calls')". Los Angeles Times. 2016-12-08. ISSN 0458-3035. Retrieved 2017-07-14. ^ Grobar, Matt (2017-02-17). "'Lion' Composers Dustin O'Halloran And Hauschka On The Trial And Error Involved When Two Composers Are In The Picture". Deadline. Retrieved 2017-07-14. ^ "Sony Classical Announces 'Adrift' Soundtrack". Soundtrack.net. Retrieved 2018-06-12. ^ "Hauschka | Album Discography | AllMusic". AllMusic. Retrieved 2017-07-14. ^ "Hauschka". Discogs. Retrieved 2017-07-14. Wikimedia Commons has media related to Hauschka.